In French oak barrels holding 500 litres for about 16-18 months, it is then poured off into stainless steel tanks where its rests for 4 months before being bottled. It settles in the bottle for additional 6-8 months. Available about 26 months after the harvest. Deep ruby-red hue with garnet reflections. 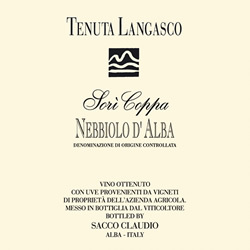 A great structure and a complex bouquet, in which the elegance of the Nebbiolo grape with flavours of violet and black fruit stands out. Full-bodied and pleasanlty warm in the mouth.